Growing evidence supports the important relationship between trauma and academic failure. Along with the failure of “zero tolerance” policies to resolve issues of school safety and a new understanding of children’s disruptive behavior, educators are changing the way they view children’s academic and social problems. 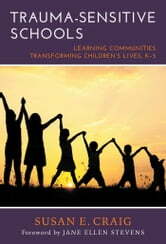 In response, the trauma-sensitive schools movement presents a new vision for promoting children’s success. This book introduces this promising approach and provides K5 education professionals with clear explanations of current research and dozens of practical, creative ideas to help them. Integrating research on children’s neurodevelopment and educational best practices, this important book will build the capacity of teachers and school administrators to successfully manage the behavior of children with symptoms of complex developmental trauma. —Susan Cole, director, Trauma and Learning Policy Initiative, Massachusetts Advocates for Children, and Harvard Law School. —Julie Beem, MBA, Executive Director of the Attachment & Trauma Network, Inc.